Words. I love words. I like the look of them, the feel of them in my mouth, the sound of them. I like their stories, their histories. I love the way that they are so concrete yet so open to interpretation. I love the power that they’ve had to inspire people of generations. Words are the building blocks of all creation. Without words, not only are we nothing but that nothingness cannot even be expressed. I don’t ever remember not being able to read. I don’t know when I learned–if I was particularly young at starting or not, I don’t know. I just don’t remember ever not reading. I do remember starting to write. And to create. I’d create all kinds of worlds and scenarios on notebook paper and in my head. I remember writing a Christmas book when I was in third grade–I made the cover and the illustrations and everything. When playing outside as a kid, words were often the best toys I had. I’d create all kinds of stories of policemen, soldiers, warriors, and wizards. I’d describe what was going on as I pantomimed my inner reality. To this day, I try to live out my more adult dream of being “A Writer”. I write stories. I blog. I write review books. I also write scenarios for roleplaying games that my friends and I enjoy. I find that I’m better with the written word than I am with the spoken. I often find myself tongue-tied amongst folks I don’t know very well. But inside…inside I still have my warm, glowing words. So, here’s the big shocker: I’m thankful for words. For filling my childhood with wonder. For giving me purpose now. For continuing to inspire me and make me more human. 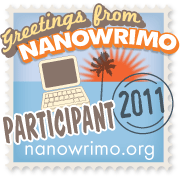 This entry was posted in Ramblings and tagged thanksgiving, words. Bookmark the permalink.